EstateGuru is all about making investing more convenient and transparent for the investors. Thereby, complying to the investors’ wishes we have implemented a new „Shared account“ feature which allows investors to unite their EstateGuru accounts to others for a variety of purposes. Many investors have expressed the wish to provide access to their accounts for third parties who would be able to either see their investments’ performance or download the reports. 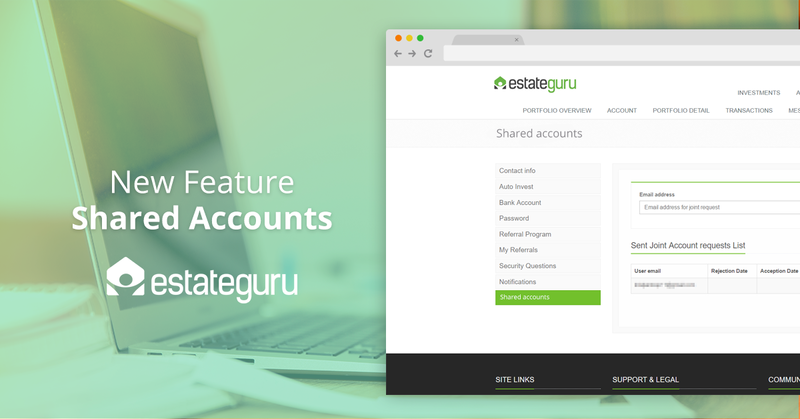 Therefore, EstateGuru created the „shared account“ functionality which enables the investors to do just that! For an example, the investors may now allow access to their bookkeepers who can easily reach the necessary financial data. The shared account functionality can be set up by sending an invitation to an already existing user to gain access to your investor account. The access will be granted once the user accepts the invite to view the account. However, both users can decline the invitation or being able to view the other person’s account at any times, for an example when the employment contract has ended and there is no reason for the bookkeeper to have access to the respective account. When a user has been logged in while being a member of the shared account system, then the accounts can be easily switched from the above right panel. This will ensure that all transactions are displayed separately and the respective reports are independent from one another. The functionality has been created as complying to the investors’ wishes. Due to this, all feedback or suggestions regarding the user experience of the functionality are welcome! What happens when a borrower defaults?